This weekend, Stonemaier Games hosted its fifth annual Design Day. On Saturday, various hosts in St. Louis (myself and a few others) held day-long game days at our homes. 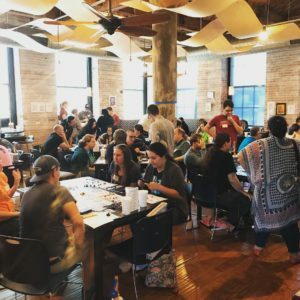 On Sunday, the Design Day itself featured designers, playtesters, and gamers from St. Louis and around the country for 10 hours of playtesting and gaming at Pieces Board Game Bar and Cafe. The purpose of Design Day is to bring together designers and playtesters to give and receive feedback on game prototypes, expand their network within the gaming community, and learn from clever mechanisms in published games. If you’d like to know details about how the day is structured, you can read about previous Design Days here, here, here, and here. 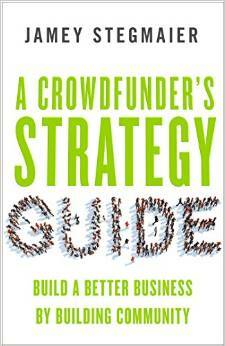 As I mentioned last year, I thought about framing this article as a Kickstarter Lesson. After all, the blog is about crowdfunding, so there are certainly some things to be learned from building community through events. I also thought about talking about events like this from a publisher perspective in terms of ROI (return on investment). Rather, Design Day is just something I like doing. I like doing it for the designers. I like doing it for the playtesters and gamers. And I like doing it for me–it feels good for me to host something fun and useful for others, and I get to play games for a day with awesome people. Plus, it gives me an opportunity to scout potential Stonemaier Games publications. How Does Design Day Work? I opened ticket sales in the spring to past attendees, then any remaining tickets went to e-newsletter subscribers who signed up before they sold out (space is limited at Pieces to around 100 people). I charged $40 per ticket, which covers about 80% of the total food/beverage/space cost for the day (Stonemaier subsidized the rest). I sent monthly emails each month for 6 months, each containing new information and an actionable step for attendees. Probably the most complicated step is creating the calendar of events, which requires us to consider game length, player count, table size, etc. I have a friend who is very good at sorting through this puzzle on a Google Doc, which we share with attendees so they can sign up for specific games. I hosted a casual Saturday game day (along with a few other hosts in the area) at my home, mostly geared towards out-of-towners. Design Day itself was hosted by Pieces, which provided the space, food, and drinks (and access to their huge game collection). The schedule of the day is preset–people sign up for tables in advance. Past attendees know this system really well, so I never had to interrupt the day with a single announcement, yet every game ran on schedule. Attendees were also flexible for games that ended early or when the designers didn’t show up–they simply picked another game to play. My co-founder, Alan, and I spent most of the day observing various games, and we got to play a few of them. We weren’t always able to do this at Design Day, but having Pieces as the host enabled us to have a lot of freedom during the day. As playtesters tried out each prototype, they wrote down a 1-10 rating on a little card. Design Day isn’t a competition; rather, the ratings are meant to help designers figure out how much work their games need (and perhaps they can offer those designers a boost of confidence or something quantifiable to show to a publisher or their Kickstarter backers). Have you found value in running or attending events related to your industry? If you want to attend Design Day next year, feel free to enter your e-mail on our “back in stock” notification, and we’ll announce any additional slots in our April e-newsletter. This event is so great. I always look forward to going and really enjoy an even that is well run. You, Alan, your team, and Pieces do an awesome job. It was great to playtest and learn so many games. I look forward to next year! This was my first Design Day and it certainly was a fantastic experience! Everyone was an absolute pleasure to interact with from our hosts, the venue, other designers, and most importantly – fantastic playtesters. Thank you ALL for being a part of this weekend! I had a wonderful time. It was great to get feedback on a design, but even better to spend the day with a bunch of good people doing what we all love. It was my first time and I’ll definitely be back next year. Thanks to Jamey and team and everybody who attended! Thanks Matt! I’m glad you had fun. It’s neat to see the sense of community form among the regulars, but also that they’re very inclusive to new attendees. I personally think that it helps that people are choosing the games in advance–that encourages people to play games with a wide variety of attendees. With 100 people, how many folk does everyone get to really interact with? Do you have anything (beyond the games themselves) to encourage interaction? I’d love to be able to come one day! Sounds like you’ve run some great events! I’m curious what the guests will say, but I actually think there’s a pretty broad level of interaction due to attendees choosing tables throughout the day in advance based on games instead of people. Without that, people might not move out of their comfort zones; instead, they’re playing with as many as 7 different sets of people throughout the day. As for anything beyond games, there’s mealtimes and free time (and the bar), but nothing else structured beyond the games. In the early years, I tried some “getting to know you” activities, but people seemed to really just want to get to maximize their gaming/testing time. I would say that as great as the playtesting feedback was, the personal interactions were definitely the best aspect of Design Day weekend. I thought the level of interaction was perfect for exactly the reasons you mention, Jamey- signing up for games based on their descriptions ensured substantial interactions with anywhere from 4 to 8 different groups on Design Day itself (depending on game length), and the meal times as well as the whole Saturday game day offer plenty of extra time to chat with people. I’m glad you cut the “getting to know you” activities from the early years, since what better way to get to know people than by playing games with them! You’ve really hit on a great format… Can’t wait until next year! Thanks for writing this up. 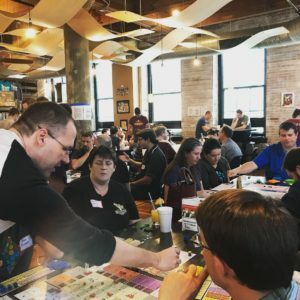 My Omaha design group, Spielmasons, hosted our first Protospiel this year and we are hoping to expand for 2018, so reading about how others put on events is helpful. I’ll maybe do a more formal post-event blog post about ours soon. So awesome to hear about another successful event. 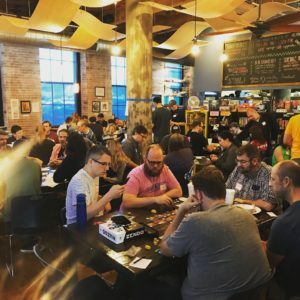 What you (and your team) provide to the board game community is truly exceptional! Thanks for all that you guys do! I wish I’d had something like this! I went through most of the design process while I lived in Korea (gotta fund that artwork somehow) and the support network just isn’t there. There’s a small group of designers in Seoul but if you live in another city you’re out of luck. Then in the run up to Kickstarter I’ve moved back to the UK into a small town so there’s nothing here either! I’m glad that you’re in a position to help people like this. Maybe you should do a design day on tour! 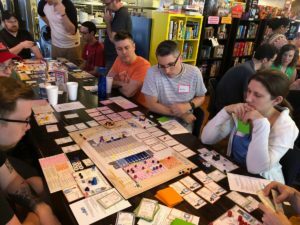 Have you heard of UnPub and Protospiel? They’re national organizations that host days similar to Design Day (different structure, but same general idea). Yeah I’ve heard of those! Another two that make me wish I lived in the States.